Tour To The Pyramids, Saqqara, And Memphis. Luxor Full-Day Tour: East & West Banks. Tour To The Valley Of The Kings, Hatshepsut Temple And The Colossi Of Memnon. Tour To Ramesseum, Valley of the Queens and Deir el Madina OR Tombs of Nobles. Habu Temple, Tombs of Nobles and Deir el Madina Tour. Tour To Abu Simbel Temples By Road. Egypt 11 Nights / 12 Days. Arrival at Luxor airport or train station. Visit the East bank of Luxor which includes the Karnak and Luxor temples. Visit the West bank of Luxor which includes the valley of kings Hatshepsut's temple and colossi of Memnon. Sail to Edfu via the lock of Esna. Visit Edfu temple by a horse carriage. and the temple of Philae. Breakfast – lunch and dinner on board. 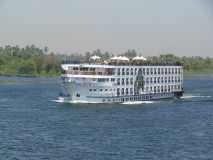 Sail to Esna then to Luxor. Transfer to Luxor airport or train station. All transfers in air conditioned tourist coach. English speaking guides for all the tours will be on board with you. All meals from day one’s lunch to last day’s breakfast. All the services depend on the sailing circumstances. You can arrange the days of the tours with your guide as you. 800 $ per single cabin in 7 nights. 1000 $ per twin cabin (two people) in 7 nights. Elmadena Elmenawra St. In front of Luxor security Directorate, Luxor, Egypt.